Brad and I had the honor to speak at the recent EmTech Caribbean in Santo Domingo, hosted by MIT Tech Review and Universidad Dominicana O&M. The two-day conference included insights shared by twenty-one speakers on topics around technological advances that will revolutionize the world in the coming years, including artificial intelligence, machine learning, personalized medicine, renewable energy, and robotics. We shared our thoughts on the impact of emerging technologies on global issues such as longevity and financial inclusion; the enthusiastic and passionate engagement that we received was humbling. As it turns out, a lot of the challenges that we experience in the US is not unique to us. For example, the population in the Dominican Republic is expected to increase from around 10.7 million to over 12 million by 2030, driven largely by a growing population aged 60 and older. Around the world, countries including Japan, China, Finland, Italy, and UK are grappling with the impact of an aging society, and the challenges around accessibility, housing, healthcare, and financial well-being. In Finland for example, those who are older than 65 surpassed those who are under 14. Between now and 2050, the number of Americans over 65 will double, and about 25 percent of the world’s population will be over 60. 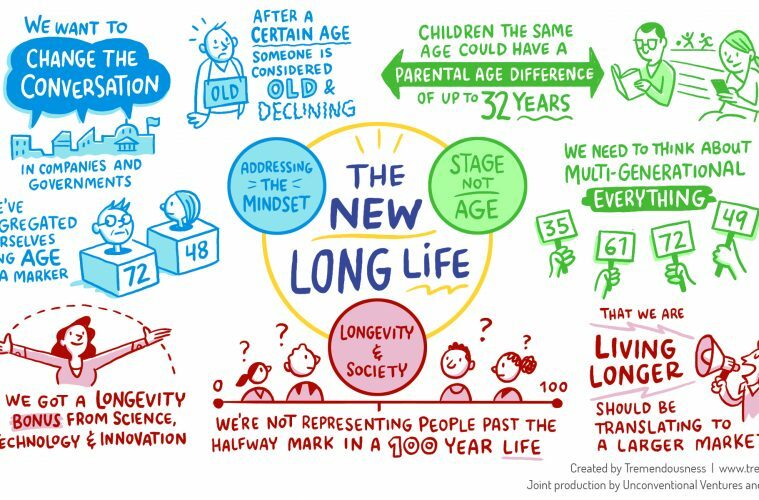 Which brings the question – is 60 still considered old when we have another 30 years to live? Should mandatory retirement apply if we still have more productive years ahead of us? Perhaps it is time to re-define “old age”. As the number of people living well into 100 years and beyond increases , it is no longer meaningful to classify the entire group aged 55 and above as “old”. With the longevity bonus that we have gained through advances in science and technology, most people that are in their 50s, 60s, or even 70s are still active, both mentally and physically, with plenty to give. They are culturally, socially, technologically, and economically connected, and are active contributors to the longevity economy. Respecting and caring for our seniors go beyond obligations and duties; to be able to give back to the society is an honor and privilege. All that we learn from caring for one another help us grow and become better versions of ourselves. In this era where we seek to digitize our lives in every way we can – we must not forget what makes us humans, and the value of families, traditions, and relationships. Listen in to our conversation with Bradley Schurman and Lilian Myers of EconomyFour, on our next episode of Shades of Grey on iTunes and Spotify, as we talk about the new old age.